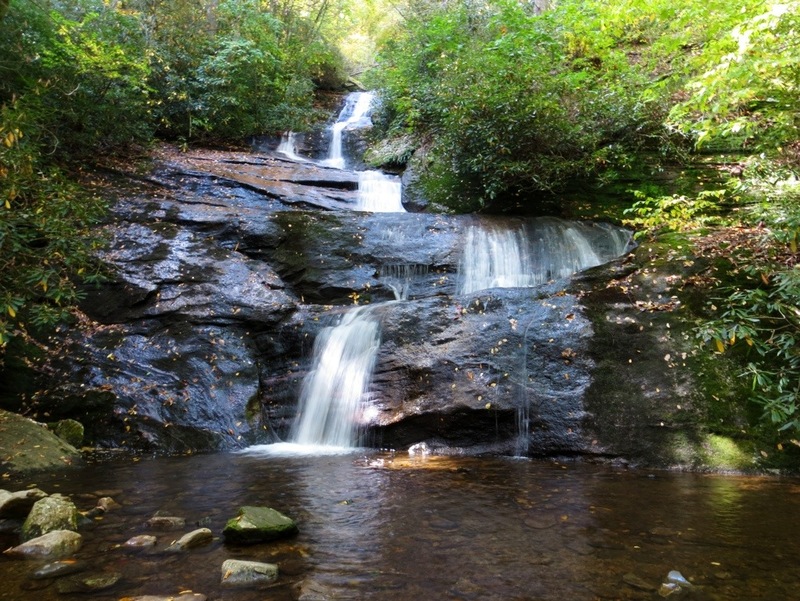 Roaring Fork & Setrock Creek Falls….Just More To Love About The Mount Mitchell Area!! One of my favorite routes to the NC mountains includes traveling via I-40 to exit 86 in Marion, then routing my way to NC Hwy 80. The route that NC 80 takes once it winds past Lake Tahoma, is one that is straight out of a Forza video game. The crazy twists, turns, narrow & sharp U curves, just make it so fun to drive. 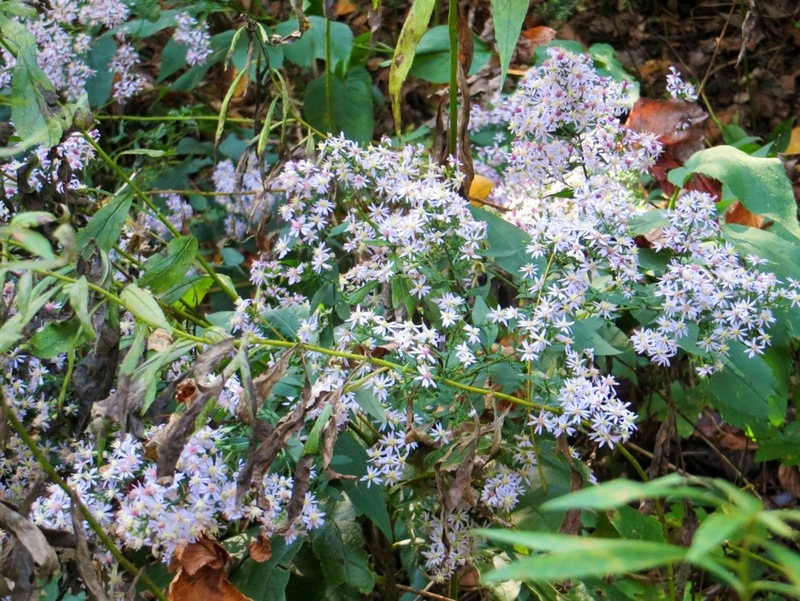 By the time the climbing stops, one will find itself at 3000 feet or so, crossing the Blue Ridge Parkway. It is not the elevation gain that is that crazy, just the way it does it. I have traveled many a mountain highway, this one is tops. Knowing that, please be careful if driving it. The real cool aspect to Hwy 80 is not the elevation gain, or even how it does it, but instead where it takes you. Once on the parkway, going left will take you to Mount Mitchell State Park where you can access the highest peak in the eastern US at 6684 ft, Craggy Gardens and some very special views and numerous other overlooks. 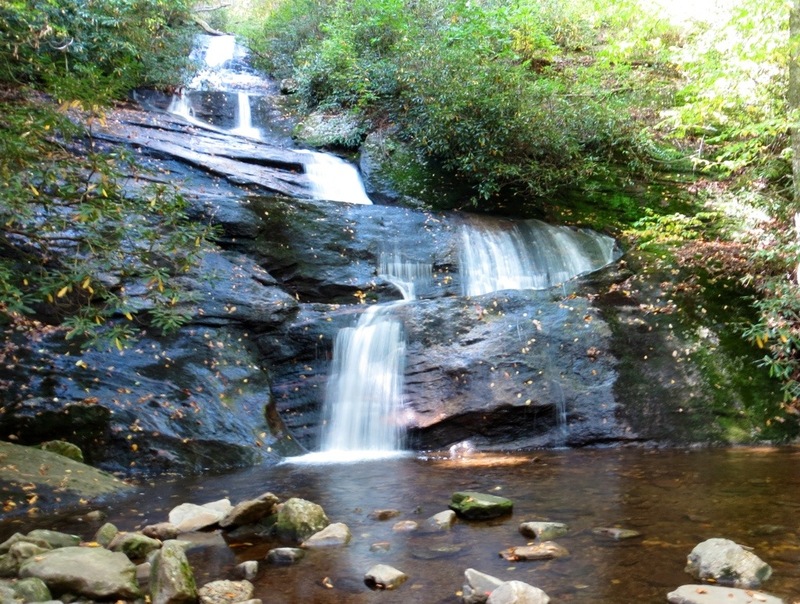 Going right on the BRP, you are just minutes from the Crabtree Falls area with the campground, coffee/gift shop, hiking trails, and my favorite…Crabtree Falls. 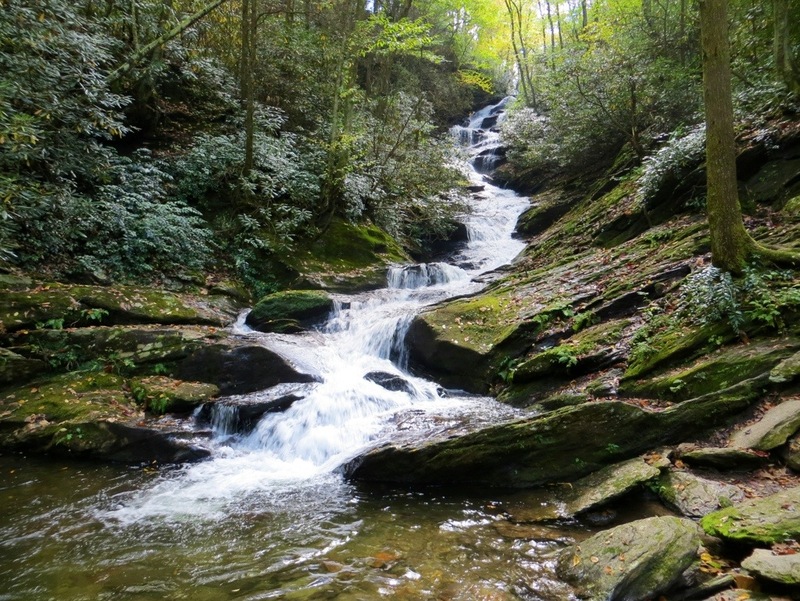 Keep going up the parkway and you will soon be in Little Switzerland with lots of shopping, good dining and Grassy Creek Falls. 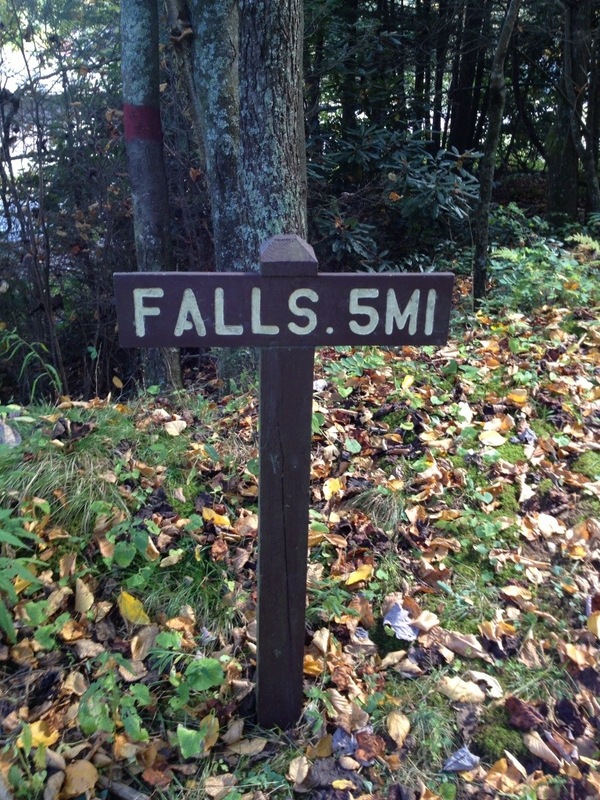 Just a few miles more and you come to Linville Falls. So it’s really the location that Hwy 80 crosses the Parkway that makes it such a special route. But….what happens if you just skip the parkway and just keep on NC 80? Well, this day I found out. The road heads back down hill for a ways, then at 2.2 miles past the BRP comes the entrance to the left that leads you to Black Mountain Campground. 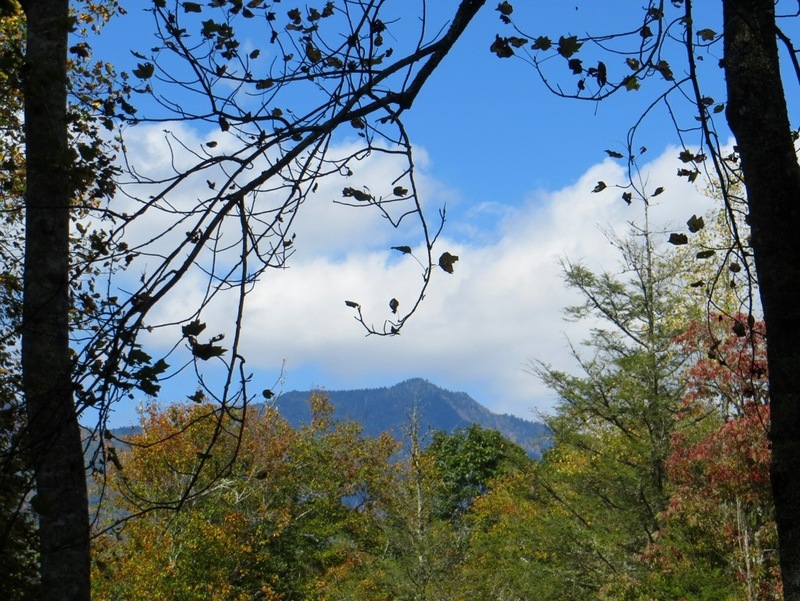 Don’t pass this by, there are plentiful hiking, camping opportunities here and even my other hobby, golf at the legendary Mount Mitchell Golf Course. 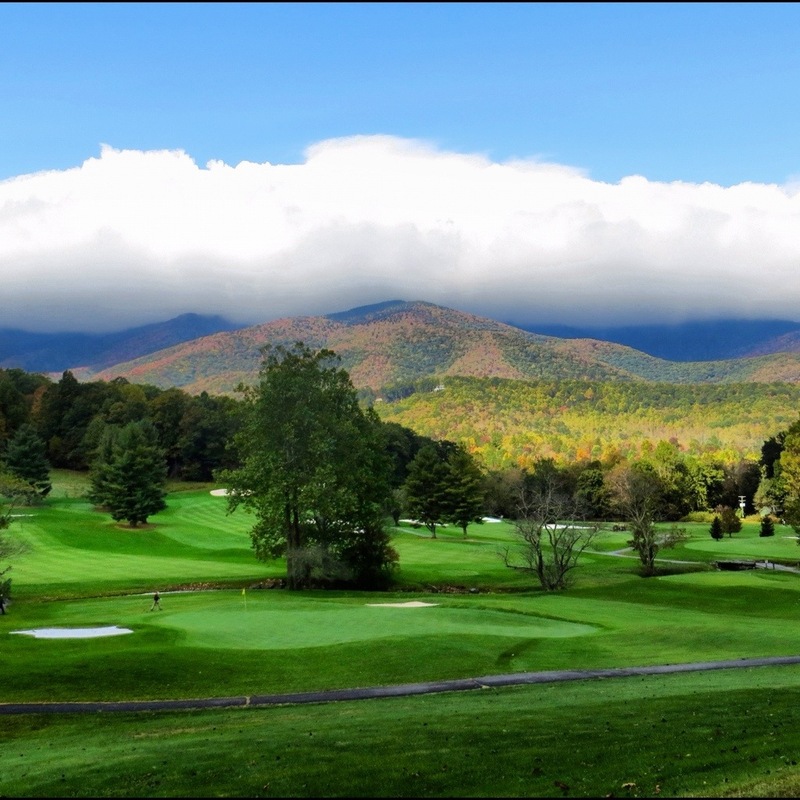 Finding such a beautiful golf course on the back side of Mount Mitchell with the giant mountain looming all around was a real treat for me. Notice the cloud on the mountain, even as it is clear and sunny everywhere else, Mount Mitchell looms in darkness way up there some 3700 feet up and 20 degrees colder. This was such a find that a friend and I returned days later just to play golf. It was very beautiful with the South Toe River flowing all through it and witnessed some huge trout in some of the pools. At that point I wanted to go fishing. This is why people love to camp up here, so much to do!! Anyway, at 2.2 miles past the parkway, turn left onto South Toe River Rd, cross the creek and immediately take a a left. 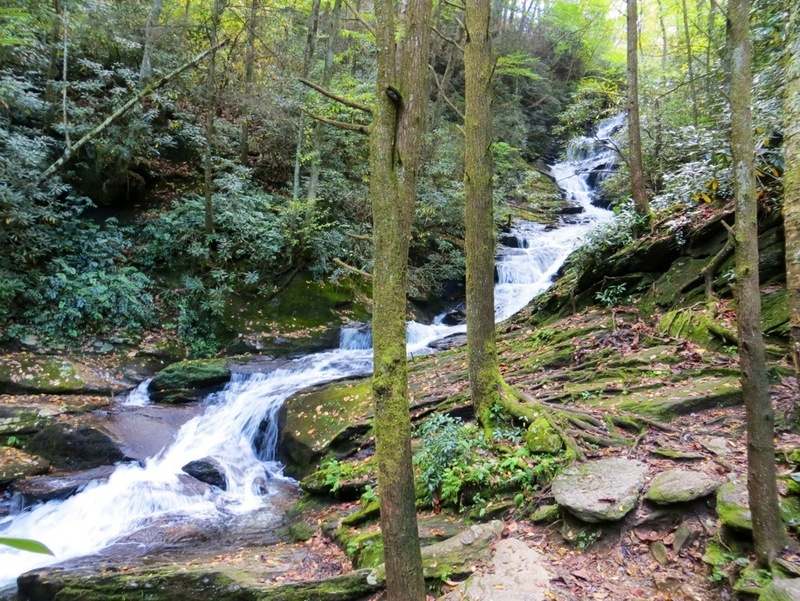 This will get you to the first waterfall featured here, Roaring Fork Falls. 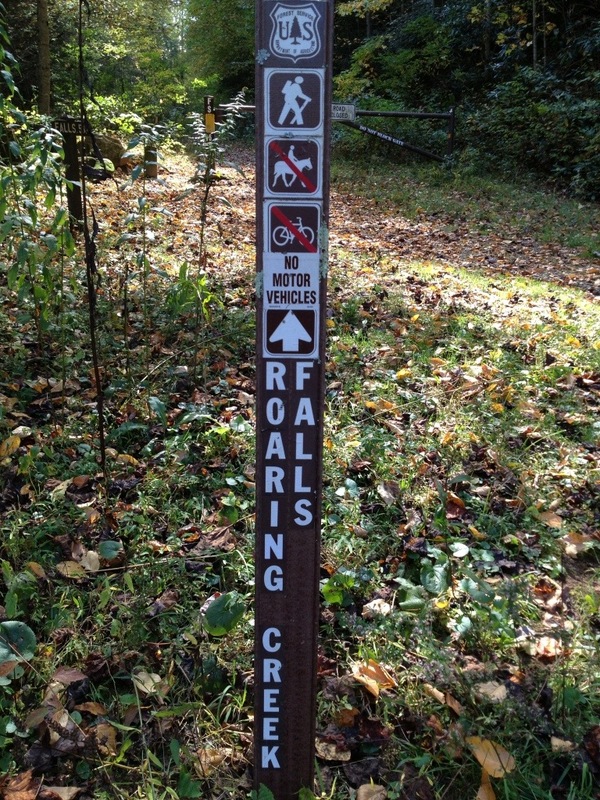 Follow this a short ways and it will dead end, this is the parking area, the trail head is well marked. The trail to Roaring Fork Falls is just .5 mile one way, just a slight ascent to get there on a very well maintained old logging road. It is a very pleasant hike. 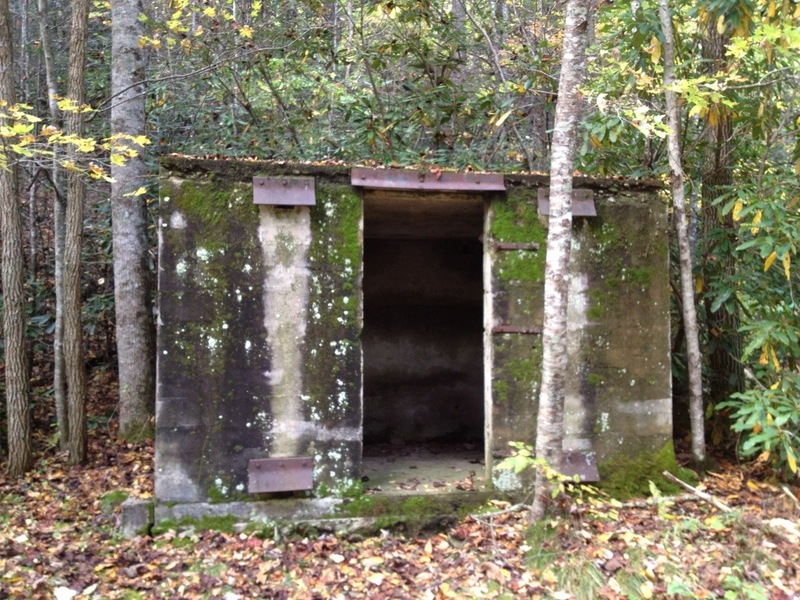 There are a few old, deserted buildings to add to the scenery. It won’t be long before the road makes a sharp left turn, the trail to Roaring Fork Falls breaks off here, crosses a small bridge and then becomes a smaller trail covered in roots, just for a short ways though. Soon, you will arrive to a surprisingly beautiful long waterfall, that is 45 feet high, but 100 feet long. Pictures just do not do it justice. After returning to the car, head back to the entrance, instead of turning back onto Hwy 80, turn left. You will pass numerous views of the golf course. In a short ways , make a right turn towards the campground and pull into the visitor parking area. Here , lies a huge map station of all the trails. 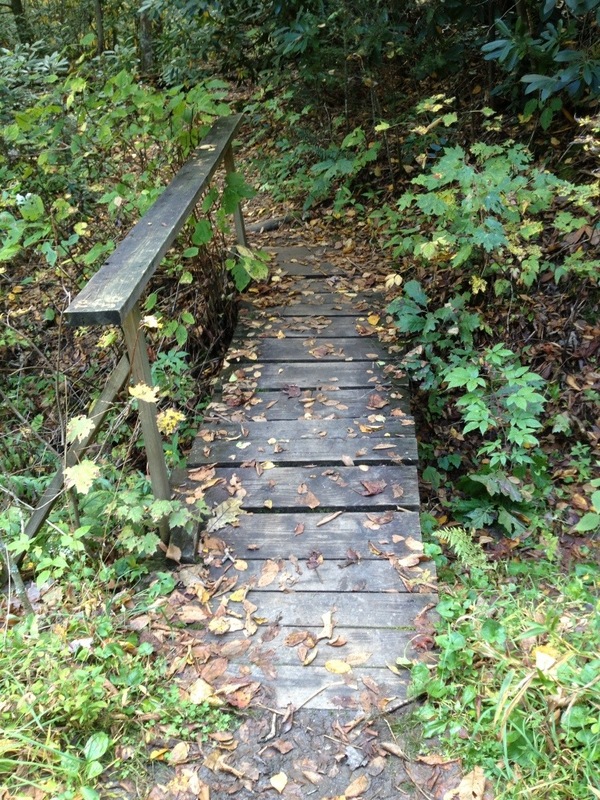 Pass this by and cross the bridge over the South Toe River into the campground. 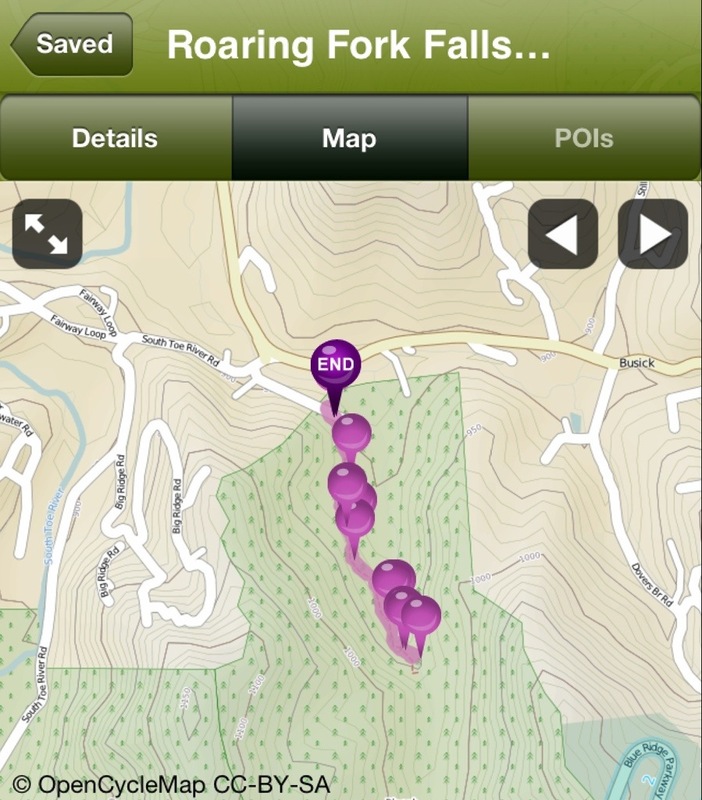 The first left goes past several campsites then begins to slowly climb. 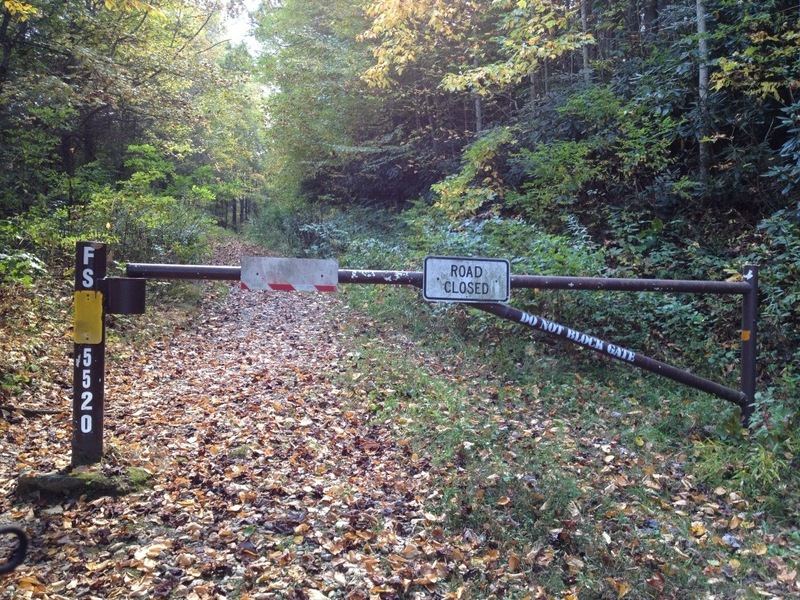 The trail head for Setrock Creek Falls is just ahead. Before I got there, I discovered a different trail head. One that I have been wanting to hike for 2 years now, ever since climbing the Profile Trail to Calloway Peak on Grandfather Mountain. 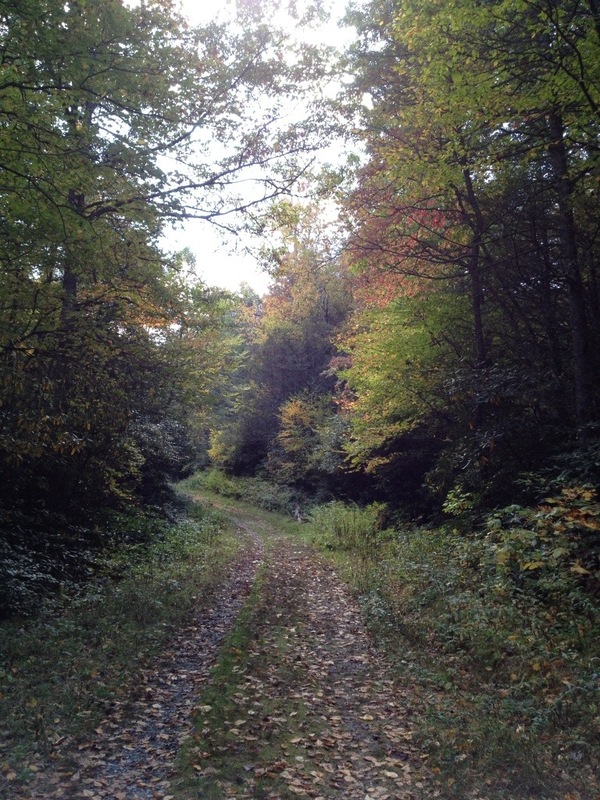 This trail is the one and only Mount Mitchell Trail, the one that runs 5.6 miles and climbs more than 3700 feet. I did not have the time,or supplies today for this but I will be back!! Just past this wonderful discovery, is the Setrock Falls Trail. 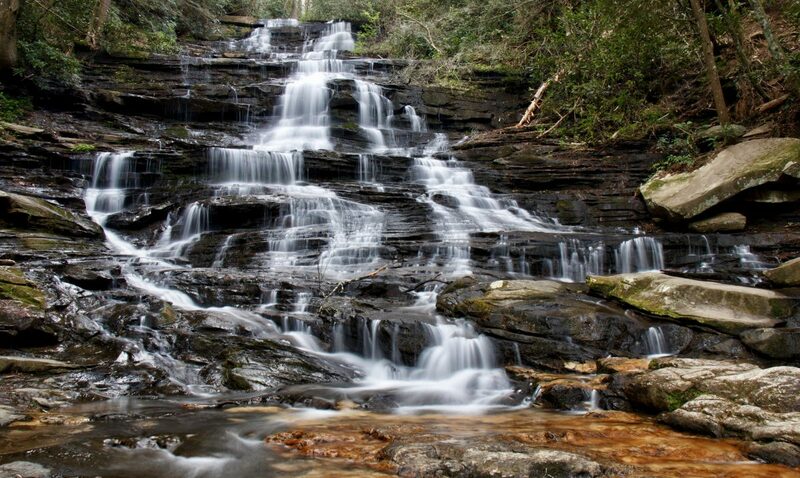 Once reached, it is a short climb up the creek to this very nice 75 ft, 6 tiered falls. To get the best view, there is a dead tree that crosses the creek that must be crossed. Once there, it’s a very nice falls. In the map picture of the hike, the soon to be hiked Mount Mitchell Trail can be made out winding up the mountain. Today, though was just about the waterfalls here, and after returning to car, my fun day here was over. This was a great find today for me! !